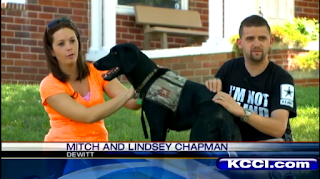 Dog attack separates veteran from his service dog. One of Paws & Effect's successful service dogs was attacked on Saturday night. We wish both Mitch and Merritt the best. Merritt is currently back with his puppy raiser and Paws & Effect will work with him over the next few weeks to see if we can get him back on the road to a full recovery. Watch the story on KCCI. Newer PostDog attack separates veteran from his service dog.